As the weather cooled over the weekend, audiences chose the warm familiarity of Liam Neeson losing his family and punching his way through foreign nations, a guaranteed delivery of goods that justified the hassle of pulling on a sweater. 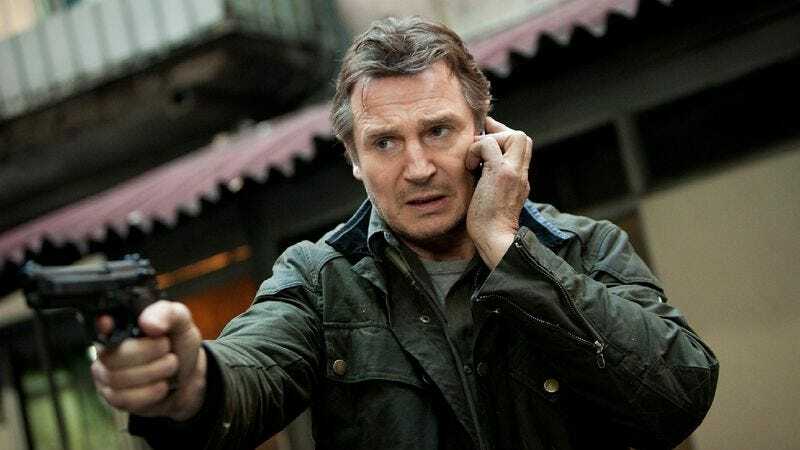 Taken 2 took in around $50 million—more than double the first film's haul, making it one of the best October debuts ever. It also likely all but ensures a third edition, where Neeson insists that his family just stay home and barbecue or something, and they enjoy a pleasant if tense meal. "I have a particular set of skills—and washing dishes isn't one of them," Neeson will joke, and everyone will laugh at this sardonic reference to darker times. Familiarity seemed to breed contempt for the weekend's other big debut, however, as Tim Burton's Frankenweenie pulled in a mere $11.5 million to land at fifth place, a dismal opening that represents Burton's worst wide release since Mars Attacks!. You could attribute this to a number of factors—a lack of Johnny Depp, the fact that black-and-white convinced the populace it was one of them fancy French movies, general Tim Burton fatigue—but the most likely seems to be the strange glut of horror-themed stop-motion animation films lately, with Frankenweenie scoring less than even the $14.1 million raked in by ParaNorman in August, and well below last week's Hotel Transylvania (which remains at second place). That Disney chose to release Frankenweenie a mere seven days after Adam Sandler and Co. put on their own monster puppet show suggests just how much they overestimated the "prestige" factor when it comes to movie-going kids. Elsewhere, Pitch Perfect continued to benefit from being the only film women are biologically capable of watching when not being dragged along on dates to Taken 2, with its 81-percent female audience boosting the Anna Kendrick musical to third place in its new expanded release. Meanwhile, Looper's similar word of mouth helped sustain it at fourth place despite a more than 40-percent drop (though it's already doing better than its most comparable recent sci-fi film, Source Code). Finally, Lawdy Lawdy, Nicole Kidman Done Peed On Zac Efron eked out a decent $10,000-per-theater haul in extremely limited release—foretelling the day when it will be a successful midnight movie hosted by drag queens dressed as Kidman's heat-crazed Southern sexpot—while similarly small debuts The Oranges ($180,000 / $1,636 per theater), V/H/S ($40,000 / $2,667 per theater), and Wuthering Heights ($8,800 in one theater) did the best they could without the promise of Nicole Kidman peeing on something.